Under a bright winter sun and blue bird sky, we walked on the frosty frozen earth, and felt the drips and drafts of a fresh winter snow falling off the pines and oaks over head. 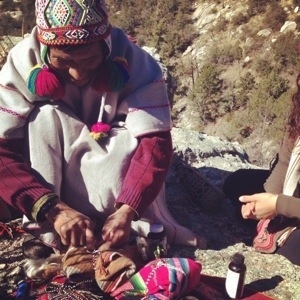 Yesterday I was given a beautiful opportunity to take a Peruvian elder and traditional Qero shaman into the mountains of my desert home, and help to honor and welcome the spirits of the land and mountains in ceremony with him. In his mixed Spanish and Quechua, he explained to us how important it is to carry your medicine right side up, to not turn it over, upside down or on its head. To me, a mesa medicine carrier, it literally means making sure to honor and take even more responsibility for the medicine I have worked for and put into my mesa, a travelling altar and personal sacred object. It means, don’t turn that bundle upside down, ” no lo volteas, asi volteas tu corazon, tu mente, tu medicina” If you turn it upside down you won’t be able to think clearly with your heart and your wisdom, your mind and heart will also be upside down. We each carry medicine for ourselves and gifts for the world, even you don’t carry around a physical object that holds and represents that for you. The question begs to be asked- “are you holding yourself right side up? ” What does that mean? How do you hold yourself right side up? In light of my week, which started in a cloudy fog of depression and sadness that had been clinging for weeks, which I took to ceremony…to the land…to spirit. Me, my medicine, my heart and spirit had a good talk about ego, surrender and for wisdom to know how to find my way out of a seemingly unending cycle of victimization, blame, ego and heartache. The answers came quickly this week, with the help of plant medicines to shift the energy and move what has been stuck in my spirit and body- especially my favorite mountain ally- mountain marigold- tagetes lemmonii, and a lot of tulsi basil- another plant which can help dispell negative energy and stuckness, and bring back a sparkle out of a fog. I shed a lot of tears. I let that difficult energy move. I moved my body more than I have in months- walking hours on the land- extra long yoga classes. I got my answers, and boy if they were hard to hear, but exactly, 99.9% the truth I needed to know to begin to move forward from the stuck place. I have been holding myself upside down, figuratively, and physically. But back to holding yourself, and your medicine right side up? For most of us, this looks like how we hold ourselves in integrity- taking responsibility for our thoughts, for our actions, and choices, for how we speak to ourselves in those shadowy corners of our convuluted minds and emotional bodies. Do we walk our talk? Do you practice what you preach? I know as a practitioner, I know it is often difficult to take care of ourselves the way we would encourage a client, we forget things, we know things, but don’t do them most of the time. But this is often true of humans in general. We long for accountability and support. We want to feel that we aren’t in it alone. That’s why we are here together, to help and reflect to each other. This isn’t about beating yourself up about it, that would be holding yourself upside down. But it is about accepting responsibility for how your hold yourself. In your own heart and mind. And how you hold integrity and right relationship with the world around you- your family, community, environment and spirit. Have you ever felt as if your life has been on its head? Topsy Turvy? I’m betting we all have at some point or another- its life, and its human- but this gentle reminder from a wise healer from the mountains of Peru- holding yourself upright- is pertinent and helpful. If you’re feeling upside down, stuck, out of alignment- begin by looking at how you are holding yourself. Listen to that truth, no matter how hard it is, and ask spirit, by whatever name, to assist. Ask the plant medicines to come and support your process. Speak to yourself with love and gentleness, forgive yourself and others, return to your “practice” -weather it be prayers, daily yoga, meditation, herbal and dietary self care, walking in nature, tending your garden. Tend yourself and your medicine – essentially your “gifts” to share with the world- with responsibility and love. His other massive and tiny piece of wisdom that stuck with me so strongly, through the sage and tobacco smoke, the chiming of his bells or the happy lilt of his flute- was to “walk with faith, never doubt yourself. ” When you doubt, you begin to hold yourself on your side. Your turning over your intentions and desires by holding them in a place of doubt, rather than faith, that the universe is on your side, and will give you what you hold with faith and right relationship. Walk with faith friends, hold yourself right side up, turn to the plants that help you in this way. 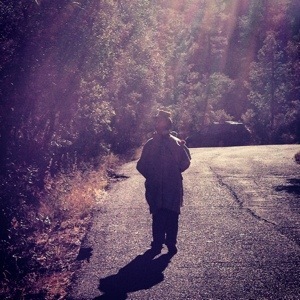 If you need support and guidance with finding ways to turn yourself right side up, and plant allies or ceremony that can help with this process, I can guide you and am available for personal plant medicine sessions- we can discover, create, and hold ceremony and medicine for you in your process. Contact me and we’ll work together to find the medicine for you. 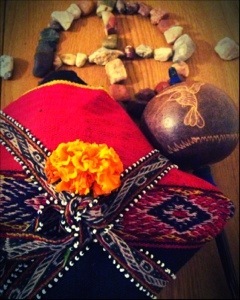 Sacred smoke or smudge with sage, juniper, copal or other herbs. Nervines and diffusive happy making herbs like marigold, tulsi, lemon balm, rosemary. Adaptogens which give you strength, resilience and energy like ashwaganda, schizandra, reishi. Your personal plant allies that show up and help you when you ask. Keeping the faith; be healthy and have a wonderful of holidays. Thank you for sharing. Really thank you.